For a brief time Sunday night, Carli Lloyd's Wikipedia page listed her position as "President of the United States." Lloyd scored three goals to lead the United States to a 5-2 victory over Japan for the team's record third World Cup title — and first since 1999. Lloyd's hat trick came in the match's first 16 minutes. When it was over, the captain of the U.S. team collapsed to her knees and pumped her fists. Delran, New Jersey's own Carli Lloyd scored a hat trick in the first 15 minutes of the World Cup final, leading the US Women's National Team to victory. NBC10's Matt DeLucia reports her hometown is now celebrating her. "I'm so proud and so zapped at the same time. It's a surreal moment," the 32-yard-old midfielder said. "It's been amazing. We just wrote history and brought this World Cup trophy home." Even the actual President chimed in with congratulations. "What a win for Team USA! Great game @CarliLloyd! Your country is so proud of all of you. Come visit the White House with the World Cup soon," President Barack Obama posted to Twitter. The New York City Mayor's Office congratulated the team for its "tremendous achievement," and told NBC 4 New York it is exploring logistics and "talking with the team and other partners about a possible ticker-tape parade." While winning the last three Olympic gold medals, the U.S. had struggled in the World Cup since taking the title at the inaugural tournament in 1991, and then again at the Rose Bowl eight years later. Christie Rampone, the only holdover from the 1999 team, lifted the trophy with Abby Wambach, the 35-year-old former FIFA Player of the Year who has said this will be her last World Cup. Wambach was among the most vocal opponents of FIFA's decision to play the tournament on artificial turf. With FIFA President Sepp Blatter staying away from Canada during a U.S. criminal investigation of soccer corruption, the trophy was presented by FIFA Senior Vice President Issa Hayatou of Cameroon, the head of African soccer's governing body. 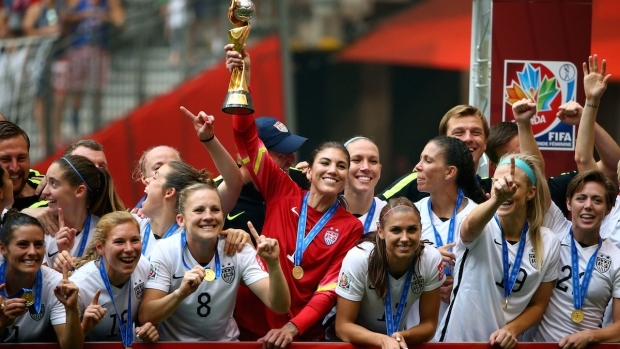 Hope Solo won her second straight Golden Glove as top goalkeeper of the tournament. She played despite critics who urged the U.S. Soccer Federation to drop her after she initially faced two misdemeanor counts of domestic violence from a June 2014 altercation at her half-sister's house, charges that were dismissed earlier this year. Solo, who hasn't spoken to the media for most of the tournament, proclaimed simply: "We did it! Awesome!" She was later quoted by FIFA.com as saying: "It feels so good. It was incredible. This is surely the peak of my career." The title, which adds a coveted third star to the American uniform, also vindicated the USSF for its decision in April 2014 to fire coach Tom Sermanni, who had replaced Pia Sundhage the previous year, and replace him with Ellis, the British-born American who had been an assistant on the coaching staff. Ellis' tactics and lineups were criticized early in the World Cup tournament when the U.S. offense sputtered at times. She shifted Lloyd to an attacking midfielder in the semifinal against top-ranked Germany and again in the final, and put 22-year-old Morgan Brian, the youngest player on her roster, in a defensive midfield role. "When you go through a tournament of seven games, there are peaks and valleys," Ellis said. "Players get hot, and you ride the players that are hot. 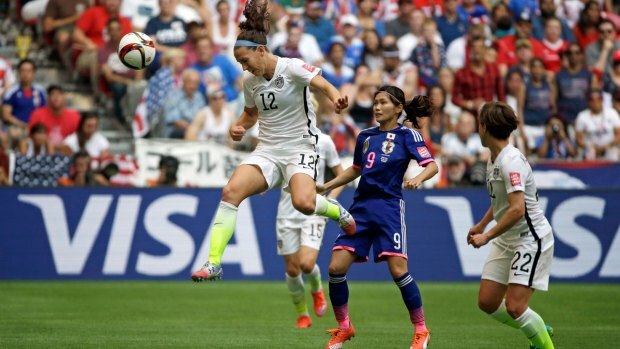 For Carli, the attacking part of her game, she was doing tremendously well." Lloyd had come up big before, scoring the winning goals in the 2008 and 2012 Olympic finals. The Golden Ball winner as player of the tournament, Lloyd scored twice in a span of about 135 seconds as the U.S. led 2-0 by the fifth minute. Lauren Holiday boosted the U.S. lead in the 14th, and two minutes later Lloyd made it 4-0 with an audacious 54-yard, right-footed shot from midfield that sailed over goalkeeper Ayumi Kaihori. Japan closed on Yuki Ogimi's goal in the 27th and an own goal by Julie Johnston on an errant header in the 52nd. Tobin Heath scored two minutes later. Lloyd's hat trick was the fastest in World Cup history — men or women — and Lloyd became the first American since Michelle Akers in 1991 to score multiple goals in a World Cup final. The only other hat trick in a World Cup final was when England's Geoff Hurst scored three times against Germany in the men's 1966 final at Wembley. "Miss Lloyd she always does this to us. In London she scored 2 goals and today she scored 3 goals. We are embarrassed," Japan coach Norio Sasaki said. "But she is an excellent player and I really respect her and admire her." Lloyd scored six goals in seven matches during the monthlong tournament, including in every U.S. game of the knockout phase. She raised her international goals total to 69 and joined Carin Jennings in 1991 as the only Americans to win the Golden Ball. Ogimi's goal was the first Solo allowed after five straight shutouts. The only other goal scored against her came in the first half of the tournament opener against Australia. The United States went 540 minutes without conceding a goal, the longest streak in the World Cup since Germany's record 679 scoreless minutes from 2003-11. Japan's victory over the United States four years ago was its first World Cup title and it came just months after the massive earthquake and tsunami that hit Japan, killing more than 20,000 people and touching off the worst nuclear catastrophe since Chernobyl in 1986.